Cassandra is an Ohio native moved south dedicated to helping others be the best version of themselves. Since she was young, Cassandra always found herself staying active and looking for ways to improve her health and well-being. However, when she suffered a sudden loss, her traditional health and fitness routine just didn't cut it. 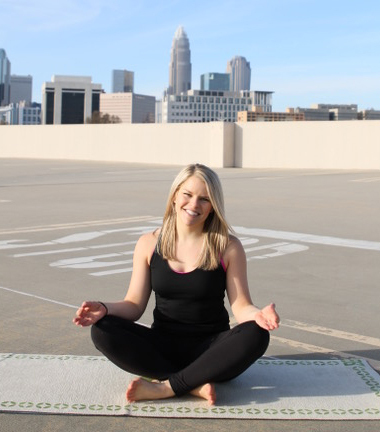 Starting her yoga journey in 2013, Cassandra quickly fell in love. She began to heal in ways she didn't even know she was broken. Yoga helped Cassandra get out of her mind and into her body. It helped her maintain a healthy lifestyle – body, mind and soul – allowing her to find a renewed outlook, celebrating all of life's highs and lows. Excited and eager to share her love and knowledge with others, Cassandra completed her 200-hour teacher training at the beginning of 2017. Her classes are energetic, playful, empowering and sequenced to build strength, confidence and flexibility – on and off the mat. While not teaching yoga in the traditional since, you can find Cassandra living it in the mountains hiking, walking her dog and exploring the globe with her husband. Reach out to her on Instagram @CassandraHradek.